Why does a cat lover need cat repellent? Well, there are a number of reasons, including controlling where your cat goes or controlling where a neighbor's cat goes. As we know, cats are very independent creatures. 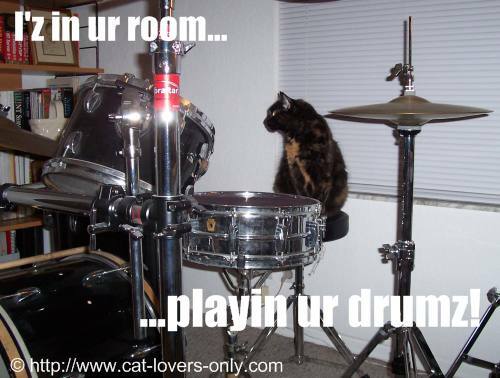 Cats definitely march to the beat of their own drummer. As Ellen Perry Berkeley said, "As every cat owner knows, nobody owns a cat." There are places, however, that you might not want your cat to go and you have to do your best to let her know what's expected. Indoors, this may include kitchen counters, tables, or areas where food is stored. You may want to keep your cat off the couch, or at least, you don't want it scratched up. You also might want to keep your cat away from certain areas of the house where you have guests, other pets, or so that family members with cat allergies get a break. Outdoors, you may want to keep a stray cat or a neighbor's cat out of your garden or yard. Maybe you want to stop a foreign cat from defecating on your lawn or spraying to mark territory. Perhaps instead, your own cat is the culprit, and is eating certain plants in your (or your neighbor's) garden or using the gardens as a litter box. Maybe you want to keep a cat out of a sand box. Sand boxes make great outdoor litter boxes for cats. Many disputes among otherwise neighborly people involve cats trespassing in yards and gardens. For these situations you may want to take steps to keep your own cat out of certain places in your yard or your neighbor's yard. Keeping cat feces out of the yard prevents the spread of disease. This is especially true near walkways where foot traffic is heavy and in garden areas where handling soil is common. You don't want contaminated soil making its way into your house. Keeping hostile cats away eases the stress level on your cat. Keeping your cat away from your neighbor eases the stress level on you. Sometimes, "standard" behavior modification techniques, such as reward/scold don't work that well. This is especially true when you can be consistent about it. It's also impossible to control a stray or neighbor's cat this way, and difficult if your cat is outdoors. For all of the above circumstances and more, some type of cat repellent may be necessary. Using a cat repellent really is a behavior modification technique. So, how do you modify a cat's behavior? There are a number of ways to do this but let's start by discussing the principles of attraction, repulsion, and barriers. Cats can be very determined creatures when they want something. Simply scolding your cat may not be enough to keep her out of an area, especially if you can't be around to consistently do this. In addition, while scolding does work for certain cat behavior problems, scolding alone may in some cases make matters worse. Making an area more attractive to a cat will get part of the job done, but the long term solution for keeping cats away from an area is to use either repulsion or a barrier. We repel the cat by making an area unattractive, or setting up a barrier. At the same time, we make a different area more attractive so that we offer an alternative for the cat. For example, most cats are drawn to catnip. Placing catnip, catnip oil, or a catnip plant may attract your cat. This won't necessarily keep her there, or keep her out of the areas we don't want her to be in, but it will offer a distraction. We then use the other two concepts as cat repellent. If you want to keep a cat out of an area, make it less attractive. There are a number of ways to do this as well as a number of products you can use, which I will discuss below. Finally, we can use a barrier to totally prevent access. This can be difficult for certain indoor areas, and sometimes impossible for outdoor areas. We'll look at how to do this and the pros and cons of the various methods and products. As I mentioned above, cat repellent techniques come down to using basic cat behavior modification techniques. Basic cat behavior modification requires knowing what cats don't like and using that to keep them out, and knowing what cats do like and using that to attract them to a different, more desired area. predatory animals that might eat them, such as coyotes. We can, to some degree, think like a cat and use some cat psychology here. In other words, we use these likes and dislikes as an attraction/repellent.